Though Paramount Pictures has yet to confirm any of the casting news for the forthcoming franchise reboot Terminator: Genesis, that's not stopping the studio from announcing the start of production. Paramount never even took the time to reveal that Thor: The Dark World director Alan Taylor would be at the helm of this first film in a new trilogy, but that little detail has indeed been confirmed in the first photo revealed from the set as cameras roll on the first shot of the film's production schedule. 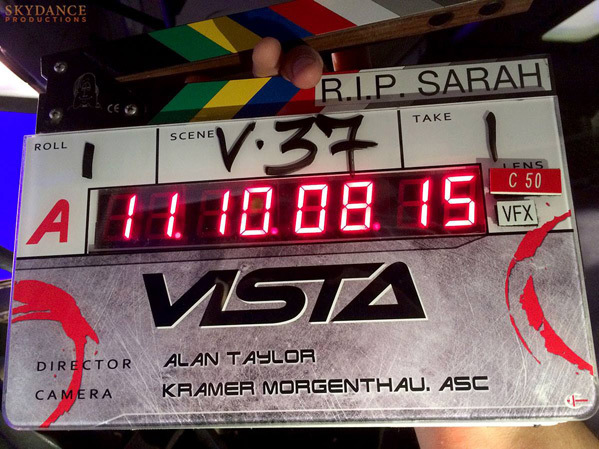 It's just a shot of the first clapboard on set, showing that the cover title for the film is Vista, so but that's all we can see. Look below! Terminator: Genesis is directed by Alan Taylor (Thor: The Dark World, "Game of Thrones") and written by Laeta Kalogridis (Avatar, Shutter Island) and Patrick Lussier (Drive Angry). No plot details have been revealed, but the film will have some sort of ties to the events of the original 1984, but time travel will come into play somehow and potentially change the franchise's timeline to allow for this reboot. Arnold Schwarzenegger is returning as the title cyborg, and he's mentioned the idea of his character aging. The cast also includes Jason Clarke as John Connor, Emilia Clarke as Sarah Connor and Jai Courtney as Kyle Reese, not to mention J.K. Simmons & Dayo Okeniyi in supporting roles. The film will hit theaters July 1st, 2015.